I have a friend who has been doing roller derby for a few years, and I asked her to get me a media pass for one of her bouts this year. I've shot a roller derby event before, and it's a lot of fun. This time, I didn't just bring my dSLR cameras, but stuck a GoPro on the helmet of one of the skaters. Derby women are creative in their uniforms and style, so capturing their persona is key for good images. Skaters are almost always in motion. You can set your ISO high and try to get a crisp shot with high shutter speed. I tend to experiment and get the girls in motion. You don't always get a clean shot, but the ones that come out really give that sense of speed. Having a long lens on a cropped sensor is also important to get great actions shots. 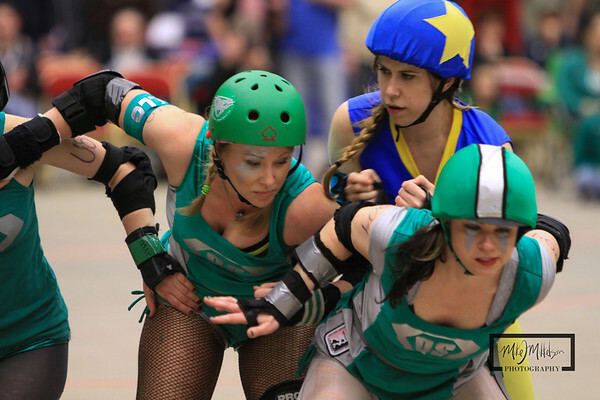 There is a lot of rough action in Roller Derby and they can be pretty intense.